As you have probably gathered already from previous posts, things are done a little differently on this side of the globe – and partying is no exception. Not that there is a wrong way to party. However, this could serve useful if this is your first time to this bizarre land and you don’t know your KTV’s from your LKF’s. This is usually pretty standard practice, world-over. This is where you make a crew, bring in stupidly cheap store-bought beers (if your hostel allows it) and organise the night’s festivities. It really is an essential part, skipping this step could result in a solo outing of extremely sober proportions – as most Chinese bars/clubs are only frequented by “big spenders” (aka those willing to spend $5 on a bottle of beer). Remember there are no open-container laws, so ensure you stock up on convenience store grog for the walk to the bar street. 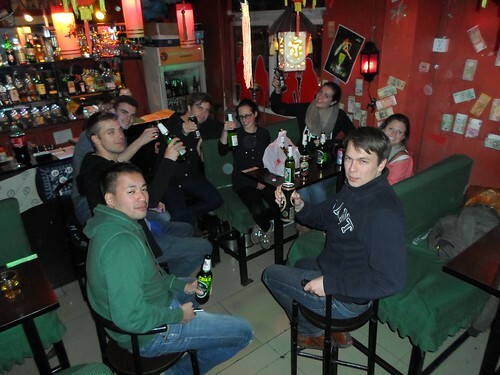 Roadies should also be partaken on the walk from one bar to another, meaning no sobering between-bar travels. 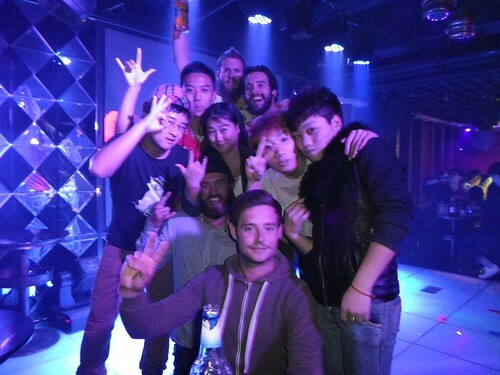 Depending on the part of China you are currently seeking a party in, you could quite possibly be the only non-Asian person on the lash that night – take advantage of your novelty value! 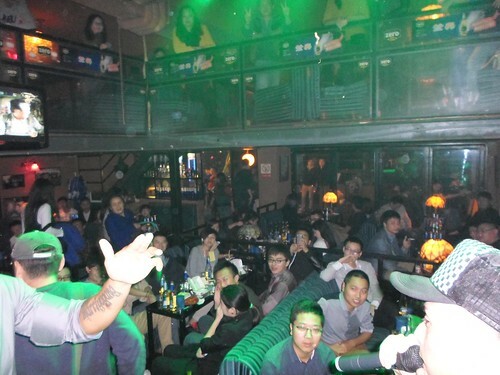 Here’s an example: in Chengdu, a crowd of us went to a bar – bringing in our own roadies, may I add – and instead of sitting in the corner, watching the dull caberet singer smash out yet another Chinese ballad, we got up on stage and became impromptu backup dancers. Anywhere else in the world, that would be an automatic dismissal from the bar, if not a punch first from the upstaged entertainer. In this instance, we were passed the mic and greeted by a roaring local crowd, all scrambling for their smartphones to record the ridiculousness unfolding on stage. These folk know exactly where your night needs to go next as they drag you to the spots that Lonely Planet hasn’t quite been told about yet. They all want to be Mr/Mrs International, the awesome local lot who are totally ‘in-there’ with the people from the other side of the world. They may not speak much English but after a few shots of rice wine, the universal drunk language comes into play! You will usually be invited to a table, in which the group have already bought a huge load of alcohol…and they expect you to drink it! As I previously mentioned, the Chinese that go out to party are generally prepared to spend huge amounts of money for their one night of debauchery, so don’t feel bad about being ‘that guy’. If, like me, your grasp on Chinese characters is weak to non-existent, you will never know the name of any of the bars that you are going to (unless you end up in a swankier, more Westernized side of town). This can work to your advantage if you are open-minded and just willing to get random! For example, after swaggering through several relatively fun bars, our Chinese buddy for the night suggested a bar that ‘may not be to everybody’s taste’. 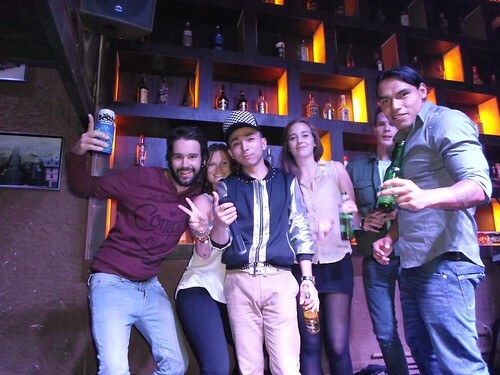 What ensued was a couple of hours spent in Chengdu’s hottest gay spot – walls awash with glitter, random drag acts that would appear without warning and more shirtless men than an Abercrombie commercial. Korben gets ‘friendly’ with the local gay scene! Before being in China, this was something that I just couldn’t even begin to understand. 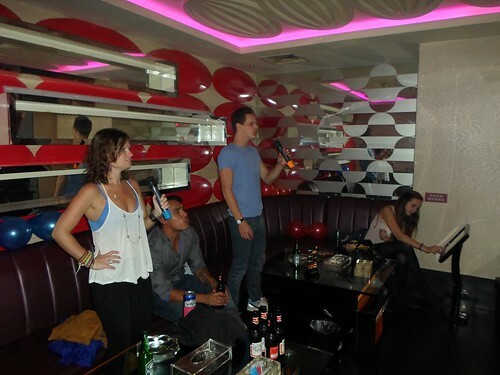 I mean, uttering the word ‘karaoke’ in the Western world clears a bar quicker than a heinous fart, yet the Chinese simply cannot consider a night out without belting out a few bars to their favorite tune. But let’s make one thing clear, Asian karaoke is nothing like the crowd repelling nights at your local pub where boozed-up baldies slur off ‘Wonderwall’, sounding like a baboon that had suffered a stroke or a chorus of inebriated women screeching a Mariah Carey ballad that have the entire audience searching for something sharp enough to plunge into their ears – Asian karaoke is a serious affair. It’s a much more intimate and private experience than you may have already encountered. Your group hires a room, and with that room comes a state-of-the-art karaoke system, a bunch of microphones and your own personal barman. Picking your song of choice is often harder than the actual performance! From what I remember (which isn’t much), you hire the room by the hour and in that time you can smash out as much Britney as your heart desires! I’ll be the first to admit that I’m not much of a singer. I can carry a tune but you certainly wouldn’t be hiring me to sing at your wedding. However, with a group who were clearly as tone-deaf/drunk as I was at the time, we took center stage and despite our shortcomings, sang like we were auditioning for Simon Cowell. At the time, we sounded like Michael Jackson but after watching a video someone had recorded on their smartphones, we sounded more like Mike Tyson! 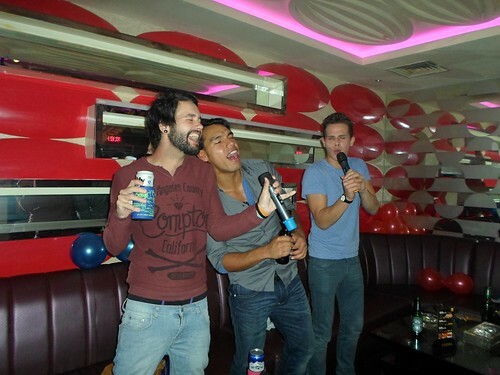 Regardless, my failings to find understanding in the Asian obsession with karaoke had finally been resolved – it was a fun experience, but one not to be repeated outside of Asian territory. Like Dorothy from The Wizard of Oz, follow China’s version of the yellow-brick road home and become awash in the never-ending sea of neon lights! 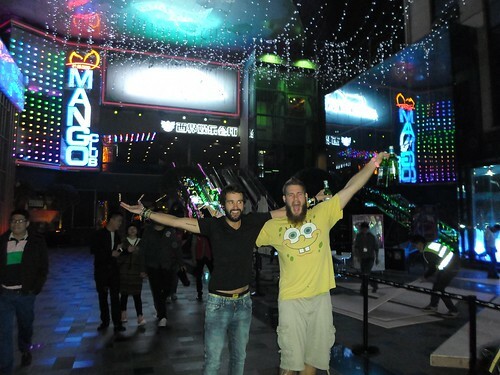 What better time to appreciate Asia’s love of all things seizure-inducing than while heavily intoxicated on both alcohol and a strong sense of belonging in a place that for one evening, you didn’t feel like such a tourist. Now, grab yourself a bag of steamed buns and get your head down for a few hours because in a place as bustling as China, there is no time for hangover days!